GREAT LENT is the time when we are called to enter more deeply into the life that God created us for...the life of the spirit...It is the time to slow down our daily pace that we may be made more aware of the Life of Christ in us. We recognize the fact that we are sinners and that it is sin in ourselves - willing what is harmful to mind, body, and soul to ourselves or others - that alone stands between God and us. Because Christ is without sin, He alone can break, destroy and trample upon that barrier between God and us. And so as we begin this great and holy season we cry out...COME LORD JESUS! The first day of Lent and Good Friday are days of STRICT FAST for all our faithful. Wednesdays and Fridays of the Great Fast are days of abstinence - No meat. Fasting is encouraged - eating NO food for a period of time and breaking the fast with the receiving of Holy Communion. For example, if you are attending the Liturgies of the Presanctified Gifts, you can perhaps fast from the noon hour until after Communion at the Presanctified Liturgy. Maintain a 'daily thread' throughout the season. For example, the daily recitation of the Prayer of St. Ephrem or the daily readings of the Scriptures. Celebrate the Liturgy of the Presanctified gifts on Wednesdays and Fridays. On Sundays during the Great Fast, the Divine Liturgy according to St. Basil the Great is celebrated. 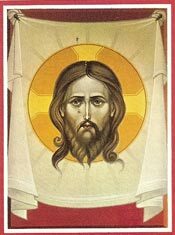 The prayers of this Liturgy are more expressive of God's loving kindness toward mankind. At the Sunday Liturgies, we sing the Beatitudes. Our Lord's Sermon on the Mount is the charter for the Kingdom of God. They do not tell us so much what we should do, but rather they are attitudes which form our foundation of Christian living. In our alms giving or concern for our service to others, we can in prayers, penances and good works, remember the sick, at home or in the hospital, the old and the unwanted, whose children forget them...the suffering and the dying, the dead...the poor who feel that we don't care about them...just more caring concern among our loved ones in the Family...or our neighbors...those who are despondent or need our support and strength. There are many ways that we can live this out and be more caring! Saint Ephrem the Syrian (ca. 306-373 AD) wrote hundreds of hymns and sermons, and verse in order to counteract the heresies running throughout the Eastern church in the 4th century. Traditional tells that he heard many heretical ideas expressed through song, and to counteract them made up his own hymns. He lived in the area of what is now south-eastern Turkey, and his words comforted against both spiritual attacks from the heretics but also physical ones from Persians invading from the East. He died in 373 while ministering to victims of plague and famine in Edessa. The prayer of Saint Ephrem summarizes the entire content and purpose of the Great Fast. For you are blessed forever and ever. Amen (Prostration). The pre-paschal fast is called Great not only because of its length, but because of its significance in the life of all Christians. Early on, the Apostles and first Christian communities replaced the day of the Jewish Passover with the commemoration of the passion and death of our Lord. To celebrate Christ's death worthily, early followers fasted on that day. By the end of the third century the Great Fast had been extended to 40 days. In the Byzantine Rite, the 40 day fast ends with Lazarus Saturday, the day before Palm Sunday. Counting back 40 days (including Saturdays and Sundays) leads to the start of the Great Fast on Pure Monday. Following the non-fast days of Lazarus Saturday and Flowery (Palm) Sunday, the Holy Week Fast begins with Great and Holy Monday and continues through the strict fast of Good Friday and simple fast of Holy Saturday. In total, 48 days separate the first day of Lent and Easter Sunday.